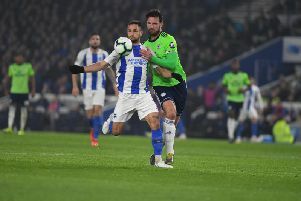 Sam Baldock is in contention to return for Albion in their Championship clash with Fulham at the Amex on Friday night (7.45pm). Baldock, who limped out of Brighton’s home draw with Burnley earlier this month, trained today having made a full recovery from his hamstring strain. However, Bobby Zamora has not trained this week and is still out with a hip problem, so will not line up against one of his former sides. Brighton boss Chris Hughton said: “Sam was back training today, so I expect him to be available for Friday but Bobby won’t be back, so that’s the good and bad.